Heat a large, wide based deep pan with a little olive oil and add the diced chilli, onion, ginger and garlic and sauté gently for 3-4 minutes until softened. Next add in the minced beef and continue to cook, stirring occasionally until the beef is browned all over. Add in the chilli powder, curry powder and soy sauce and reduce the heat to a very gentle simmer. Cover the pan with a tightly fitting lid and continue to cook for 15-18 minutes, stirring occasionally. Add in the chopped coriander. Wash and dry the lettuce leaves and drain on a clean dry cloth. 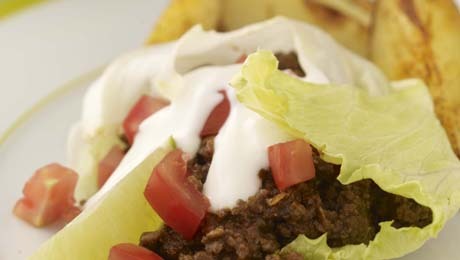 Arrange the lettuce leaves on a large serving platter and fill with some of the chilli beef mixture. Garnish with the diced tomato and natural yogurt. Pre-heat oven to 190°C/375°F/ Gas Mark 5. Place the potato wedges in a large bowl, drizzle with the oil, add the chilli powder and season with a little salt and pepper. Mix together ensuring the potatoes are well coated and place on a baking tray lined with parchment. Bake for 35-40 minutes until crispy and well cooked through to the centre. Top Tip Leftover meat mix can be mixed into some hot pasta the next day to make a tasty pasta meal or alternatively can be piled high onto a baked potato with some yoghurt or crème fraiche for a healthy lunch.